The phrase 'Southern hospitality' is commonly used in America while describing the residents of the Southern region of the country. It refers to their generosity and big hearts towards visitors, foregoing their own worries to ensure their guests were happy. 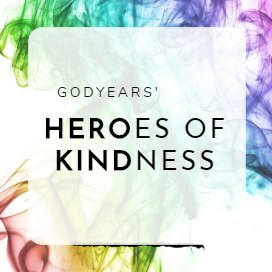 It may seem like an outdated stereotype to many, considering the harsh world we live in but thankfully, the heart willing to be kind to those in need still beats strongly even today within young individuals of the area. 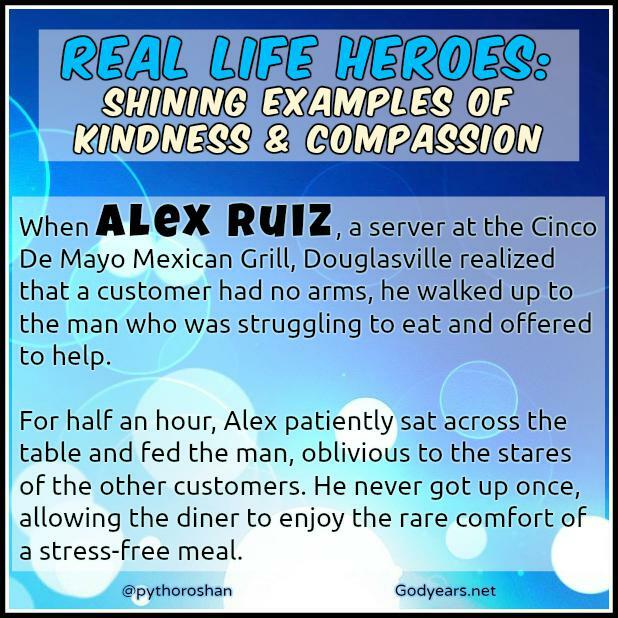 When young Alex Ruiz, a server at the Cinco De Mayo Mexican Grill in Douglasville, Georgia overheard a diner asking a fellow customer for help, he turned to see what the problem was only to realize that the diner seeking help had no arms. 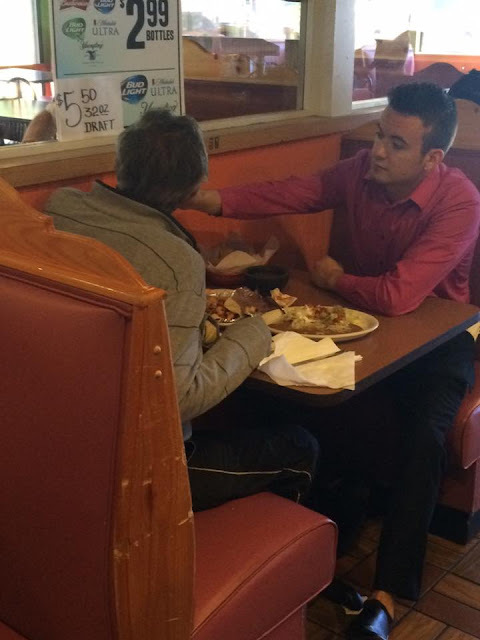 Without thinking twice, Alex walked up to the man, asked him if he could help him and sat across the table from him. Oblivious to the gaze of fellow waiters and customers, Alex patiently sat with a smile on his face for half an hour and fed the diner, never getting up once during the meal and allowing the man to enjoy this rare comfort. At 22 years of age, Alex knew to make the extra effort for a man in need. He had the maturity to understand how hard and cruel life is for a man with no hands and not be rude or mock him - or worse, ignore him as we all would have done - but to actually spend half an hour feeding a patron at the diner without being ordered to do so by a staff member. For his big hearted, selfless gesture and for adding to the legend of 'Southern hospitality', Alex Ruiz is a real life hero. Alex Ruiz is a Shining Example of Humanity. This completely warmed my heart. What a lovely story to begin the challenge! May we have more Alex-es in the world. Alex is a gem! Such people make life worth living. Looking forward to reading the rest of your posts on kindness during the challenge. Thanks Vinodini.. hoping to deliver on all 26 posts. Lovely theme :) We need such stories. Glad somebody has taken it up. Now, I too want you to complete the challenge, because such stories do inspire and inspiration is necessary to turn this world into a better place. Its something I felt was unique and worthwhile... stories we've seen and smiled at but then forgotten with all else that happens in the world. Such gestures of kindness need to be talked of more, and as Anmol says, I'm glad you've taken this theme for A to Z. :-) Will be back for your B hero. I just commented on another blog post how much I admire people who help others freely, instantly, without forethought. They simply do for others as if it comes naturally. This young man is one of those people. Definitely. Alex definitely fits the bill. Alex is surely a hero. In a world when we are more concerned of the work we ought to be doing, we seldom think of fellow humans with an element of empathy. Truer words have not been spoken, Ramya. Thanks Shalz... stay around this month. 25 more stories to go. Heart warming Story! You have lifted my moods up! All the best to your challenge! Glad I could do so. And thanks... will need it. Rare. yes. Which makes it all the more important to showcase them. I think we all have an Alex within us, we're just afraid to let him out most of the time. The world tends to be just that little bit harsher and crueler for such Alexes. Your sharing bar on the left side hides your content on desktops. Can you increase the margin a little bit? Yes, the world sadly chooses to be more critical of good guys, insane as it sounds. And Thanks for pointing out the share bar thingy. Will look to fix it today evening once I get back home. Admirable and honestly, I am overwhelmed. Guess, I will have to keep a check on my emotional side all throughout April. Thanks to your posts. 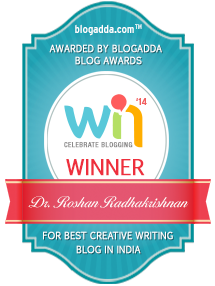 I so so so love your theme, Roshan. And this one is a great start to the challenge! Thanks Shalini... and I really envy you for being able to make 26 posts just on a holiday destination! At this point in my life, just visiting these places seems like a distant dream. Thanks Ankita. That is the plan. Our world will be an amazing place with such good souls & goodness. There are people who do good. They just get relegated to minor two line articles inside newspapers. This is an attempt to immortalize them. what a heart warming story of this young man. Real hero in life. Great to know about men who help. You picked an excellent example to start your challenge. This is a lot more than Southern hospitality. What a story. Thanks :) I do have some awesome heroes lined up. This is such a heart-warming story! And stories like these makes world a better place. This reminded me of an incident in a restaurant in Kuwait. A mentally challenged man and an old man (probably his father) were sitting adjacent to our table. The old man was feeding this young man with so much love and there was a smile on his face all through the meal time, even though the man was not eating 'normally'. Of course, the old man must be his father or related to him. But Alex is a real hero for doing this selflessly for a stranger. May his tribe increase and looking forward to all your Shining Example of Humanity stories, this April Roshan. Cheers! The Kuwait story.. These are the kind of things that need to be shared more. It's necessary for the public to know that these things happen even today. Thank you for sharing. It is good to know that humanity still strives in this 'kalyug' where technology is mishandled most of the times. Instead of helping the ailing people shoot there condition on their smartphones so that the video goes 'viral'. I will keep visiting to read more from you. In recent times, I'm shocked by how people just shoot videos instead of trying to help someone. It's bad enough that Noone stops to help but when you stop, to take a video of someone dying? How sad is that? Such people make the world still worth living. A simple act of feeding a an arm-less man speaks a lot about the compassion in his heart. Heartwarming! So true. Speaks of his character at such a young age. Thank you for sharing these stories and what a lovely theme! This warmed my heart! May this inspire the Alex in us. I hope after reading your posts we all share this kindness forward. Such a heartwarming story Doc. We need to remember that we have a little goodness in us all, and we need to act upon it more often. These posts serve as our reminders. It comes down to that really - no matter who we are and what we have done, are we capable of a single decent when needed? This is such a heartwarming story, Doc. Compassion , empathy and a little goodness is all one needs in this world. Amen to that. Yet such a rare quality today. What a beautiful story to begin the challenge with Roshan! It filled me with so much of warmth! I assure you. Plenty more to go. This made me smile and warmed my heart...so lovely to see that goodness still exists in this world. Thank you for sharing this Roshan! I look forward to more from you. Got some fun ones lined up. 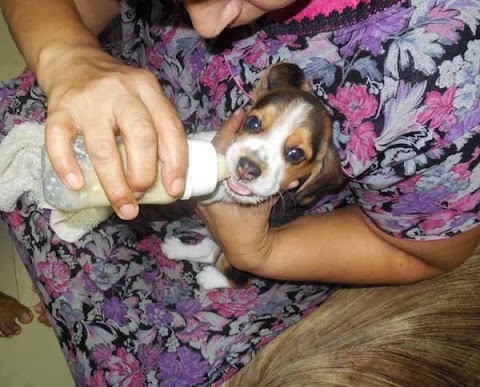 I read these heartwarming stories you share and get completely teary-eyed. Like I told you before, now more than ever, we need stories like these to restore our faith in humanity. I know. That's why I take this challenge so seriously. Trust me. A lot of work has gone in already and some more still to come. wow he is one kind soul... this is such a heartwarming story. So glad you shared this. A great theme and a great first story. It is great to know about Alex and his kindness. I wish we have more people like him who can help others in need. That's the idea - to find more people like this. Yesterday, I would have said no one would do that. Now I know. Wonderful story. We need more such beautiful stories to make us cheer life and loving even more.Loved how you made me say a silent prayer after reading this. We need to share those small stories and gestures, I feel... they make others feel better about the world. What a lovely man - good to know there are still people like him in the world! 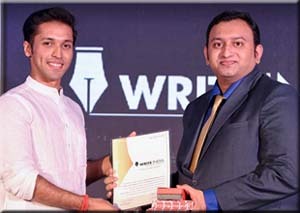 While you are already aware that your theme is right on top of my fav list this april , interestingly - I had not come across this story so the freshness of it made the joy of discovery heightened. Hanging around to read your take on B. A great start Roshan sir, the world needs more Alexes! Good luck for the entire challenge and look forward to reading about inspiring individuals and groups. What a wonderful post! Hats off to Alex for his gesture and act & a big thank you to you - for choosing such a wonderful theme! Good Luck with AtoZ. & i will be back to read these heart warming and reassuring in humanity stories. AtoZofHealing - A is for Affirmations"
In this world when some of us wouldn't mind buying food for the needy,we definitely step back when it comes to investing time for others. He is indeed an example. And not just that, the story is well written as well.